Quick Summary : Dragonwater Tea Company (now out of business) was a fine place to order teas from. Unfortunately, in July 2011, Dragonwater went out of business and doesn't seem likely to return online anytime soon. I'm keeping the review up for posterity purposes. The pricing of Dragonwater Teas is about as good as you are going to find for premium loose-leaf teas. In particular, I love that most of the samplers are priced less than $2 - with many being just $1! This makes it very affordable to try out new teas. Dragonwater Tea Company (now out of business) has a very large selection of teas. Not as large, perhaps, as Culinary Teas, but comparable in size to Adagio Teas. The quality of the leaves from Dragonwater is excellent. While I don't like every tea I try, it's not the quality of the leaves that is at fault. It's just that I don't like the taste! This is my pet peeve with Dragonwater. Their website DOES look nice. Don't get me wrong. But I find the navigation awkward and slow. Here's why. You go to their herbal teas section. Only 9 products are listed on the first page. You then have to scroll through page after page of teas to find if what you are looking for is even there. It would be nice if you could see "all teas" in a specific category without having to scroll through multiple pages. I've only ordered once from Dragonwater at the date of this writing (November 2006), but I have no complaints. All items I ordered were shipped except for one, and I got notice about that in a seperate email saying that the item was out-of-stock. Instead of holding up the whole order for this one out-of-stock tea, they simply deducted the cost and shipped the remainder. Good Policy. Orders from Dragonwater Tea Company (now out of business) generally ship within 1-2 business days after the order. My own order shipped in 2 business days and I received email notification that the order had been shipped. Oddly, they don't provide tracking numbers, so you can't track the progress of your package. Free shipping is also offered on all order of $75 or more, at least at the time of this writing. 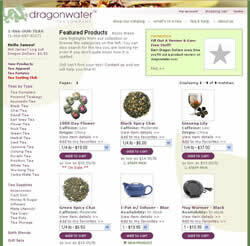 Dragonwater Tea Company (now out of business) is a great place to order tea from. Their inexpensive samplers makes them a perfect place to "experiment with teas." While the web site has some undesireable user features, overall I give Dragonwater a 5 Star Rating.